Take Klout (‘the standard measure of online influence’, according to its biog); a tweet from Mo Krochmal asking if anyone understood +k sent me to the site this evening to see what he was talking about. I still don’t know what +k is, but I found myself in a section that told me what I was influential in and how long for. 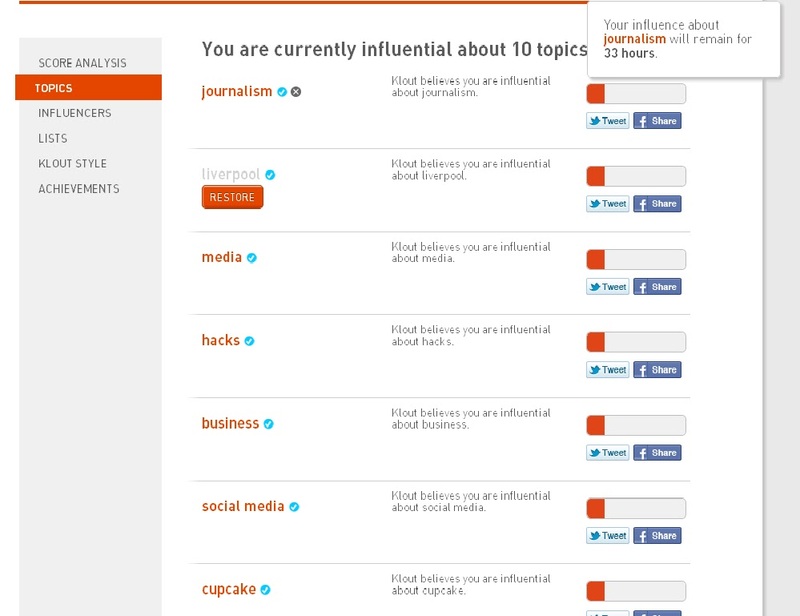 Oh yes, I am influential about Cupcake. I’ve never baked them, I certainly don’t tweet about them – hell, I don’t even eat them – but I am influential about them. It’s possible Cupcake is a geographical place where tweets are enshrined in tablets of stone and Cupcakeians (Cupcakealonians?) live their lives according to 140char observations, but… possibly it’s because I have two Twitter contacts – @Cupcake_Rev and @Cupcakesincity? I genuinely don’t know how else to explain it. Drilling down further into this ego-bruising data, my influence in Cupcake lasts 33 hours – the same as it does for Journalism. The other topics are broadly there (not sure about ‘business’ but maybe my UCLan course links have played a part) and there may be a deeper moral here but, for me, the lesson is simply this: When it comes to social media influence measurements, take it all with a large pinch of chocolate frosting. * If the admittedly-obscure title of this post doesn’t ring any vague bell, I urge you to go and buy Pratt of the Argus by David Nobbs. Forget McNaes – this is the definitive book a regional news journalist needs to know by heart.